SCVHistory.com | Gorman Area | 3 Missouri Family Members Killed, 1 Survives Plane Crash, 1964. 3 Missouri Family Members Killed, 1 Survives Gorman-Area Plane Crash. 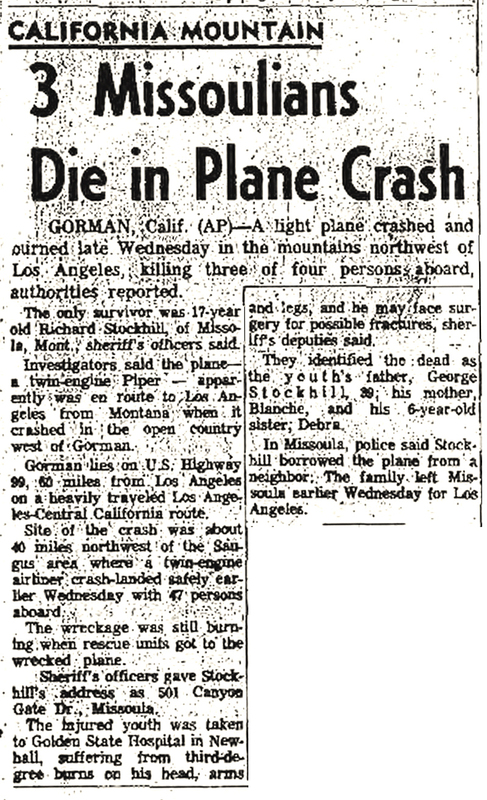 As reported below, this fatal crash of a light plane in the Gorman area occurred the same day a United Air Lines Convair 340 with 47 people on board was forced down in Saugus. Read about the UAL flight here. 3 Missoulians Die in Plane Crash. Billings (Mont.) Gazette | Thursday, December 31, 1964. Gorman, Calif. (AP) — A light plane crashed and burned late Wednesday in the mountains northwest of Los Angeles, killing three of four persons aboard, authorities reported. The only survivor was 17-year-old Richard Stockhill, of Missoula, Mont., sheriff's officers said. Investigators said the plane — a twin-engine Piper — apparently was en route to Los Angeles from Montana when it crashed in the open country west of Gorman. Gorman lies on U.S. Highway 99, 60 miles from Los Angeles on a heavily traveled Los Angeles-Central California route. Site of the crash was about 40 miles northwest of the Saugus area where a twin-engine airliner crash-landed safely earlier Wednesday with 47 persons aboard. The wreckage was still burning when rescue units got to the wrecked plane. Sheriff's officers gave Stockhill's address as 501 Canyon Gate Dr., Missoula. The injured youth was taken to Golden State Hospital in Newhall, suffering from third-degree burns on his head, arms and legs, and he may face surgery for possible fractures, sheriff's deputies said. They identified the dead as the youth's father, George Stockhill, 39; his mother, Blance, and his 6-year-old sister, Debra. In Missoula, police said Stockhill borrowed the plane from a neighbor. The family left Missoula earlier Wednesday for Los Angeles. 3 Missoulians Killed in Plane. Montana Standard | Thursday, December 31, 1964. Gorman, Calif. (AP) — Three members of a Missoula, Mont., family were killed but a fourth survived when their light plane crashed and burned in the mountains northwest of Los Angeles Wednesday. Dead are George Stockhill, 39, zone manager of Investors Diversified Services; his wife, Blanche, 31, and their 6-year-old daughter, Debra. The only survivor is Richard Stockhill, 17-year-old senior at Missoula Sentinel High School. The family was believed to be en route from Missoula to Visalia, Calif., on a business-pleasure trip when the plane, identified as either a twin-engine Piper or a Cherokee 130, crashed in open country west of Gorman. The injured youth was taken to Golden State Hospital in Newhall, suffering from third-degree burns on the head, arms and legs, and he may face surgery for possible fractures, sheriff's deputies said. Plane Crash Kills Three Missoulians. The Daily Inter Lake (Kalispell, Mont.) | Thursday, December 31, 1964. Newhall, Calif. — Sheriff's deputies today blamed poor visibility as the apparent cause of a light plane crash that claimed the lives of three members of a Montana family and critically injured a fourth. Killed Wednesday night when their borrowed Piper Cherokee 180 slammed into a mountain and burned were George Stockhill, 39, his wife, Blanche, 31, and their daughter, Debra, 6, Missoula, Mont. Richard Stockhill, 17, was reported in "extremely critical condition" by attendants at Golden State Hospital here. He underwent four hours of surgery for multiple fractures. He also suffered third-degree burns on his head, arms and legs. The bodies of the family were taken to the Ventura County Morgue, where authorities were making arrangements with survivors in Montana. Police in Missoula said the twin-engined plane, believed to have been carrying the Stockhills on a combination business-vacation trip, had been borrowed from a neighbor. Stockhill, a zone manager for Investors Diversified Services, was piloting the plane, authorities said.